Notion Theatre Company’s debut production is a great showcase of the talents of recently-graduated drama students. The quirky, relevant song cycle from Benj Pasek & Justin Paul focusses on traversing into adulthood and fits perfectly with both the young cast and the intimate space of the Landor Theatre. I’ve had a soft spot for Pasek & Paul tunes since I came across them as part of a cabaret at university. The songwriting duo penned this show during their time at the Unviersity of Michigan – a collection of songs about modern day relationships with siblings, parents and lovers. It’s like an Avenue Q without the somewhat tentative plot. There’s an admirable economy in a song cycle – sometimes it can be woven into one coherent story (see The Last 5 Years), but most of the time it allows for theatrical songs to be grouped in a looser ‘theme’ such as this. With the right material, cast and production they are often great small shows that run in one act, making them short and punchy. 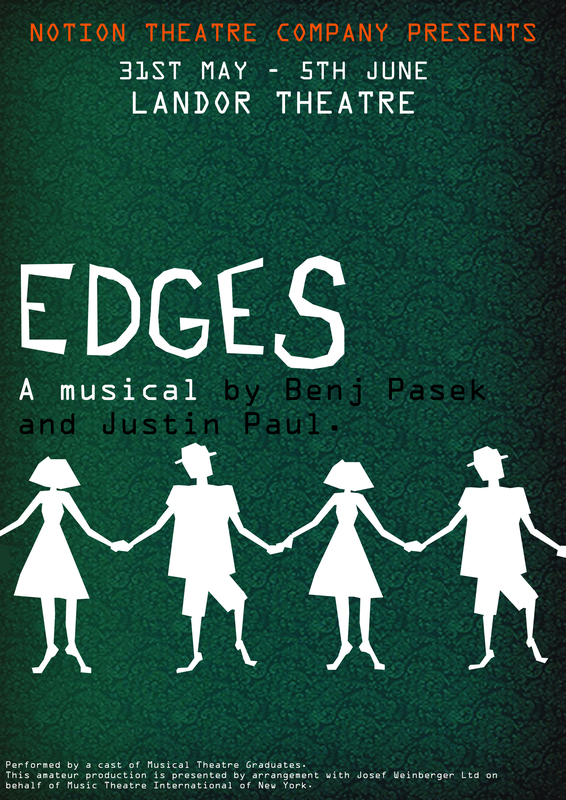 Edges is performed here with competence by a huge cast – 18 people on stage in a theatre that seats 60. Whilst it can feel a little crowded when the dancers start some energetic swinging (I was quite glad not to have plumped for the front row…), in general it is a treat to have such a large ratio of performers to audience. All performances are not of equal quality, but there are some real standout numbers amongst a strong cast. The initial company number ‘Become’ makes a great introduction, well sung and beautifully staged to show the various characters in an autumnal coffee shop. Following this, one of Notion’s founder’s Michaela Cartmell-Hull gives a great performance as Hayley in the sibling rivalry song ‘Caitlin & Hayley’, Emily Jane-Morris excels extolling the virtues of dating gay men in ‘Man of My Dreams’ and Nerine Skinner & Aaron Gibson are charming as a couple skirting round those ‘big three words’ in ‘I Mmmm You’. Tanya Stephens gives a gutsy performance of the controversial break-up song ‘In Short’ and there are great ensemble performances of ‘Ready to Be Loved’ and ‘I’ve Gotta Run’. This is well worth seeing – a chance to spot some emerging talent, get into some top new music theatre tunes and be done, ready to head home by 8.45? For only £14? What’s not to like? If you need some more persuasion, then good Youtube versions of all songs mentioned can be found on http://www.pasekandpaul.com/ – click on the ‘Store’ option, and there are links to pop-outs. Then, head over to the Landor. Tickets can be booked directly with the theatre at http://www.landortheatre.co.uk/.